Try these baked cauliflower bites for a tasty, healthy anytime snack, or to serve as an appetizer before dinner. 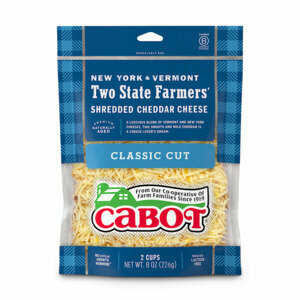 With cauliflower florets, diced red bell pepper, minced scallions, almond meal, hot sauce, and Cabot Sharp Cheddar, you will love the amazing flavor these unassuming little bites bring! Share the recipe on Facebook, Pinterest, Instagram, and Twitter with family and friends. To make 24 cauliflower bites, begin by coring the cauliflower and cutting it into florets. Process in a food processor fitted with the steel blade attachment, until the cauliflower looks like fine rice. Place 3 tablespoons of water in the bottom of a medium saucepan and add the cauliflower and diced bell pepper. Cover and steam over medium heat, stirring occasionally, until the vegetables are very soft. Line a colander with a clean linen towel and scrape the cauliflower mixture into the towel. Let sit to cool, about 30 minutes. Preheat oven to 350° F, line a baking sheet with parchment paper, and lightly mist the parchment with cooking spray. Wrap cauliflower up into a bundle and squeeze the excess moisture from the cauliflower, as directed in the recipe instructions below. 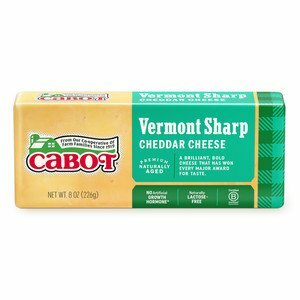 Beat egg whites in a large bowl until very foamy and add the cooled cauliflower mixture, Cabot Sharp Cheddar, scallions, and Tabasco, stirring to combine. Next, whisk almond meal, baking powder, and salt in a small bowl. Sprinkle the almond meal mixture over the cauliflower mixture and stir until just mixed together. Drop the batter by heaping tablespoonfuls onto the prepared baking sheet, spacing 1-inch apart. Bake until the cauliflower snack bites are puffed and golden, about 20 to 24 minutes. Let cool on pan 10 minutes before using a thin spatula to transfer them to a serving platter. 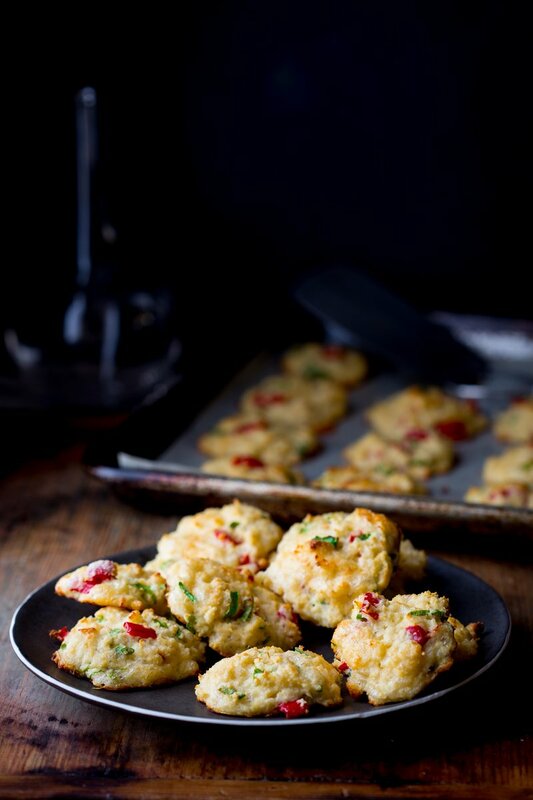 For another delicious snack or appetizer, try these Cheesy Potato Bites. 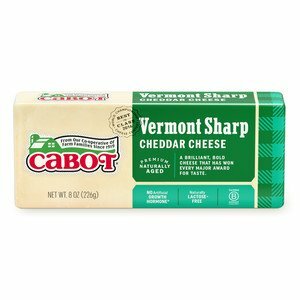 Cabot is a co-operative of over 800 farm families, bringing many years of experience to make only the best products for you and your family. We’d love to hear your feedback on these cauliflower bites, so please rate and review it when you have the chance! CORE cauliflower and cut into florets. Process in food processor fitted with the steel blade attachment, until the cauliflower looks like fine rice. Place 3 tablespoons water in the bottom of a medium saucepan. Add the cauliflower and bell pepper. Cover and steam over medium heat, stirring occasionally, until the vegetables are very soft, 6 to 8 minutes. Line a colander with a clean linen towel. Scrape the cauliflower mixture into the towel, and let sit to cool, about 30 minutes. PREHEAT oven to 350° F. Line a baking sheet with parchment. Lightly mist the parchment with cooking spray. WRAP cauliflower up into a bundle, and then squeeze bundle from the top down to remove the excess moisture from the cauliflower. Continue squeezing for several minutes until the ball of cauliflower mixture is about half its original size and you have squeezed out about ¾ cup of liquid. BEAT egg whites in a large bowl until very foamy. Add cooled cauliflower mixture, cheddar, scallions and Tabasco and stir to combine. WHISK almond meal, baking powder and salt in a small bowl. Sprinkle almond meal mixture over the cauliflower mixture and stir until just mixed together. DROP batter by heaping tablespoon-full onto the prepared baking sheet spacing 1 inch apart. Bake until the snack bites are puffed and golden, 20 to 24 minutes. Let cool on pan 10 minutes before using a thin spatula to transfer them to a serving platter. Very good! I used frozen cauliflower rice, which was a nice timesaver.